Founded in 2002 by Linda Lee Cadwell and Shannon Lee, the Bruce Lee Foundation was formed with a vision to share the art and philosophy of Bruce Lee with the world for generations to come. Bruce Jun Fan Lee was born in San Francisco in the hour and the year of the Dragon, a powerful symbol in Chinese astrology and a strong omen of the life he was to live. 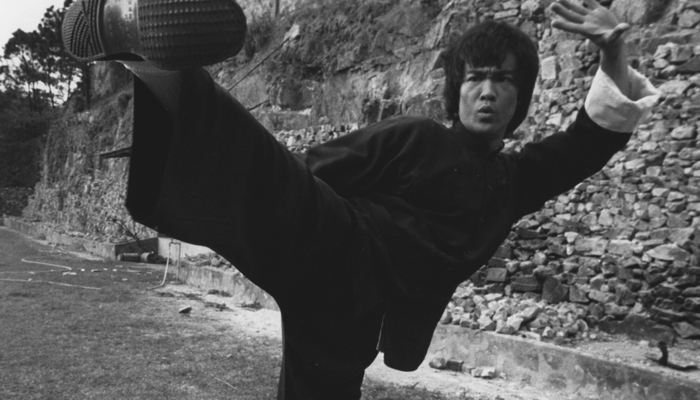 Raised in Hong Kong, Bruce began diligently studying Chinese gung fu at the age of 13. He soon realized that the value of martial arts training was found in the confidence it instilled instead of the need to defend one’s honor through fighting. During that time, he also developed interests in dancing and acting. The graceful movements he’d mastered in martial arts lent themselves to him being a terrific dancer, and Bruce’s early love of acting led to appearances in 20 films before leaving Hong Kong. In 1959, at the age of 18 with $100 in his pocket, Bruce headed back to San Francisco. In the years that followed, he majored in philosophy at University of Washington, supported himself as a dance instructor and gung fu teacher, met and married his wife Linda, and opened multiple martial arts schools on the west coast. Fate stepped in when Bruce’s otherworldly gung fu skills collided with an opportunity to return to acting in the 1966 TV series “The Green Hornet”. The birth of his two children, film roles catapulting him to success, writing, directing and developing his own martial art of “Jeet Kune Do” continued to fill his years until 1973, when he died in Hong Kong from an allergic reaction to a pain medication. Lee was 32. The actions of the Bruce Lee Foundation continue to ensure Bruce Lee remains one of the most relevant sources of inspiration, motivation, and honest self-expression to millions around the globe. Born in San Francisco, California on November 27. Appears in the first of over 20 films as a child actor in Hong Kong. Begins studying Wing Chun Gung Fu under Yip Man in Hong Kong. Becomes the Crown Colony Cha-Cha Champion in Hong Kong. Departs Hong Kong for the United States, arriving in San Francisco, California before settling in Seattle, Washington. Opens first Jun Fan Gung Fu Institute in Seattle, Washington. Opens second Jun Fan Gung Fu Institute in Oakland, California. Debuts the one-inch punch and two-finger push-up during an exhibition at the International Karate Championships in Long Beach, California and is discovered by Hollywood. Marries girlfriend Linda Emery in Seattle, Washington. Wins a challenge match in Oakland against San Francisco Gung Fu Community. Decides to change his approach to martial arts and training. Son Brandon Bruce Lee is born. Begins shooting “The Green Hornet” TV series. Opens third Jun Fan Gung Fu Institute in Los Angeles Chinatown. First time the name Jeet Kune Do appears in writing. Stars in “The Big Boss”. The film breaks all box office records in Hong Kong. Guest stars in TV show “Longstreet”. Stars in “Fist of Fury”. Appears with son, Brandon, on Hong Kong TVB Operation Relief telethon to help raise funds to aid victims of a recent typhoon and makes a personal donation of $10,000 Hong Kong dollars. Writes, directs, produces, choreographs and stars in “The Way of the Dragon”. Each film surpasses the previous in box office results in Hong Kong. Begins filming “Game of Death”. Interrupts filming “Game of Death” to film and star in the Hollywood co-production of “Enter the Dragon.” Bruce Lee appears as the first ever Asian-American actor in a Hollywood lead role. Bruce Lee passes away in Hong Kong on July 20 and is laid to rest in Seattle, Washington. Tao of Jeet Kune Do first published. Hollywood Chamber of Commerce honors Bruce with a star on the Hollywood Walk of Fame. Bruce is profiled in Time magazine's Time 100: The Most Important People of the 20th Century under Heroes and Icons of the 20th Century. Bruce is named by Premier Magazine as the 3rd most influential deceased show business talent (behind #1 Walt Disney and #2 Stanley Kubrick). Bruce Lee’s granddaughter, Wren Lee Keasler, is born. The Bruce Lee Foundation is formed. People Magazine / VH1 Special Collector’s Edition Magazine names Bruce Lee as one of 200 Greatest Pop Culture Icons. Receives the EMMA (Ethnic Multicultural Media Academy) Legacy Award in London for his humanitarian achievement through the spiritual philosophy of martial arts which challenged racism and added substance to our lives; other recipients include Ghandi and Martin Luther King. A life-size statue of Bruce Lee is unveiled in Mostar, Bosnia as a symbol of the fight against ethnic divisions. A statue of Bruce is unveiled in Hong Kong the next day. The United States House of Representatives pays tribute to Bruce Lee with an official congressional tribute on the House Record honoring his achievements and contributions to society, calling him a master teacher, a catalyst for social change and civil rights, and a cultural and American icon. Bruce is named Number 2 on the Men’s Health magazine list of Fittest Men of All Time. Sports Illustrated also names Bruce Lee one of the Fifty Greatest Athletes of All Time at number 15 on the list and is one of only two people on the list who never actually competed. The first statue of Bruce Lee in the US is unveiled in Los Angeles Chinatown. The Hong Kong Heritage Museum opens a 5-year exhibition dedicated to Bruce Lee; it is the largest exhibition on the martial artist to date anywhere in the world. Year 1 of a 3-year exhibit, “Do You Know Bruce”, opens at the Wing Luke Museum in Seattle, Washington. Bruce Lee is inducted into the California Museum’s Hall of Fame by Governor Jerry Brown alongside Charles M. Schulz, David Hockney, Lester Holt, Ellen Ochoa, Robert Downey Jr, Kristi Yamaguchi, and Buck Owens. The honor is accompanied by a year-long exhibit. Bruce Lee is inducted into the Asian Hall Of Fame by the Robert Chinn Foundation on May 14th in Seattle. Bruce is recognized for his contribution to the Asian-American experience in the USA and beyond. Linda Cadwell and actor Jason Scott Leigh accept the award on Bruce's behalf. Bruce Lee lived a life of purpose. His example provides a vehicle for people to embrace their uniqueness and discover their limitless potential.